Bailey attended North Carolina State University and was a leader in the Wolfpack's miracle run to the 1983 NCAA Championship. That year, under head coach Jim Valvano, he led the Wolfpack in both scoring and rebounding. The Utah Jazz selected him as the 7th pick of the 1983 NBA draft. Jazz management reported that he was selected for the quality of his character, as well as the quality of his game. This was the beginning of 16 years of his playing professional basketball, 12 of those years were with the NBA. 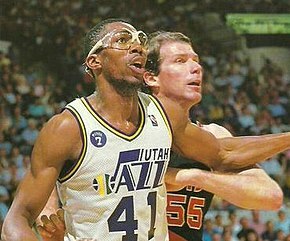 Bailey was a starter with the Jazz for most of his first two seasons, but with the drafting of Karl Malone, Jazz coach Frank Layden made Bailey one of the first options off the bench. As a result, Bailey had his two finest NBA seasons in 1987-88 (19.6 ppg, played in all 82 games with only 10 starts) and 1988-89 (19.5 ppg, 82 games, 3 starts). On November 25, 1991, he was traded by the Jazz along with a 1992 second-round draft pick to the Minnesota Timberwolves for Tyrone Corbin. Bailey holds the unusual distinction of playing 84 regular season games in the 1991-92 season, Jazz and Timberwolves combined. He played for almost three seasons in Minnesota until 1994 when he left the NBA and played in the Greek League (playing for Panionios) for the 1994–95 season. From 1995 to 1998 he played in the Italian League for Polti Cantù in 1995–97 and Stefanel Milano in 1997–98, before returning to the Jazz as a free agent on January 21, 1999. He retired after the end of 1998–99 season. Throughout his career Bailey has also been involved in community service. He has directed basketball camps for youth since 1984 in which he teaches young people lessons about life and basketball. Bailey's basketball camps often focus on students with serious illnesses or disadvantaged backgrounds. Bailey's record of service has resulted in numerous awards for leadership and contributions to the community. Included in his awards are: the NBA's prestigious Kennedy Community Award, the Utah Association for Gifted Children's Community Service Award, Sigma Gamma Chi fraternity's Exemplary Manhood Award, the Great Salt Lake Council of the Boy Scouts of America's American Champion Award and the Italian League's 1998 All Star Games Most Valuable Player. Bailey currently is a public speaker, a broadcast analyst for the Utah Jazz and the University of Utah, an actor, and a singer/songwriter. Bailey's music includes uplifting songs as well as a fusion of R&B and Nu Soul. His albums include Faith In Your Heart (1998), The Gift of Christmas (2001), and I'm Not the Same (2002). In addition to his music, he has appeared in a few films. Bailey is chairman of Big T Productions, Fertile Earth (which has a patent pending on a fertilizer that works through sprinkler systems), and FourLeaf Films. He works with various charities — including Make-A-Wish, D.A.R.E., the Happy Factory. Bailey continues to coach in the Salt Lake City area using the private coaching service, CoachUp. Bailey gave the opening prayer at the 2008 Republican National Convention. Bailey was born in Washington, D.C., and grew up in a violent household in a high-crime neighborhood in the suburbs of Maryland bordering D.C. He is the father of six children. Bailey and his wife, Sindi (née Southwick), live in Salt Lake City with their three children. Bailey has a daughter with his college sweetheart, and two sons from his first marriage. Bailey was raised Baptist. While playing basketball in Italy, Bailey decided to join The Church of Jesus Christ of Latter-day Saints. He was baptized by his father-in-law on 31 December 1995. ^ Luis Fernando Llosa (2003-11-03). "Thurl Bailey, Forward". SI Vault. Retrieved 2009-06-01. ^ a b c Robinson, Doug (22 February 2003). "Advertise with usReport this ad Thurl Bailey's wonderful life". Deseret News. Retrieved 18 August 2016. ^ a b Playing Field Promotions. "Thurl Bailey Biography". Retrieved 18 August 2016. ^ Josh Loftin (2008-09-01). "Thurl Bailey opens GOP convention with prayer". Deseret News. Retrieved 2009-06-01. ^ "Former NBA Star Thurl Bailey Shares Incredible Conversion Story". LDS Living. 17 May 2016. Retrieved 20 August 2016. Wikimedia Commons has media related to Thurl Bailey. This page was last edited on 12 March 2019, at 12:01 (UTC).